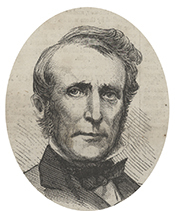 BINGHAM, John Armor, a Representative from Ohio; born in Mercer, Mercer County, Pa., January 21, 1815; pursued academic studies; apprentice in a printing office for two years; attended Franklin College, Ohio; studied law; was admitted to the bar in 1840 and commenced practice in New Philadelphia, Tuscarawas County, Ohio; district attorney for Tuscarawas County, Ohio, 1846-1849; elected as an Opposition Party candidate to the Thirty-fourth Congress and as a Republican to the Thirty-fifth and the two succeeding Congresses (March 4, 1855-March 3, 1863); unsuccessful candidate for reelection in 1862 to the Thirty-eighth Congress; appointed by President Lincoln as judge advocate of the Union Army with the rank of major in 1864; later appointed solicitor of the court of claims; special judge advocate in the trial of the conspirators against the life of President Lincoln; elected to the Thirty-ninth and to the three succeeding Congresses (March 4, 1865-March 3, 1873); chairman, Committee on Claims (Fortieth Congress), Committee on the Judiciary (Forty-first and Forty-second Congresses); unsuccessful candidate for renomination in 1872; one of the managers appointed by the House of Representatives in 1862 to conduct the impeachment proceedings against West H. Humphreys, United States judge for the several districts of Tennessee, and in 1868 in the proceedings against Andrew Johnson; appointed Minister to Japan and served from May 31, 1873, until July 2, 1885; died in Cadiz, Harrison County, Ohio, March 19, 1900; interment in Cadiz Cemetery. Beauregard, Erving E. Bingham of the Hills: Politician and Diplomat Extraordinary. New York: Peter Lang, 1989.